They have thick fur on their feet which many people are puzzled by. It isn’t there for warmth but to keep their feet from burning on the hot dessert surface. The long ears help them to reduce body heat due to the blood vessels being very close to the skin. Full grown they can be from 3 to 8 pounds in size. The males are larger than the females. They are only about 8 inches tall and 12 inches long. The Fennec Fox enjoys the warmer climates out there. They are found in North Africa living in the hot Sahara Desert. To help stay cool during the heat of the day in the desert, the Fennec Fox will burrow in the sand. They are able to jump two feet high and four feet forward which helps them to find prey and to avoid predators. This particular species of fox will form small packs which is unusual as other species of fox are solitary in nature. It is believed being in a small pack gives them more security against predators. They don’t hunt as a group but get their food individually. This species of fox has very good hearing, and they can locate prey that is moving around under the ground. They hunt at night and feed on a variety of animals including rodents, rabbits, and birds. They also consume insects and eggs. They have been seen drinking water but if they don’t have access to it their body will adjust so it isn’t a necessity. 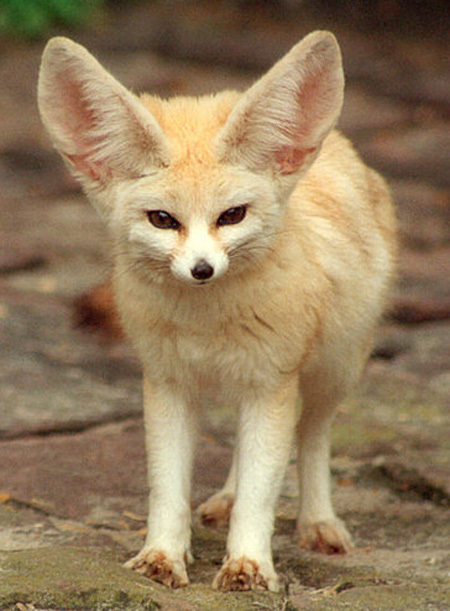 The Fennec Fox is mature and able to mate when it is about 9 months old. Mating usually takes place in January and February. The young are born in March and April. The males are very protective of the females they mate with. Once she is pregnant they will hunt for her so she doesn’t have to. They will also bring food once she is caring for young. There are conservation efforts in place for the Fennec Fox because of their environment being destroyed. There is no evidence that they are in danger of extinction at this point in time. Yet their numbers have dropped continually for the past couple of decades due to humans taking over their environment. Due to the small size of them, this is a type of fox that many people find exciting to track down and to hunt. Another reason for the hunting is that the people of Africa like to use their gorgeous coats for making various things. Due to their small size, there are some areas where the Fennec Fox is being bred as house pets. Since they don’t grow any bigger than a domestic cat many people are thrilled by the idea of owning such a pet. They do seem to do well adapting to such environments, and they are being sold for thousands of dollars each. It can be difficult to care for one though as they are very energetic. They are social animals and their need to be around others of their species isn’t something that can be taken away from them when they are removed from a natural environment.